Curcumin and Turmeric – Which is Better? There is a buzz lately on turmeric and curcumin. But what exactly are they, and how are they different? Turmeric was traditionally called Indian saffron since its deep yellow-orange color is similar to the highly regarded saffron. It has been used throughout history as a condiment, healing remedy and textile dye. Turmeric comes from the root of the Curcuma longa plant and has a tough brown skin and a deep orange flesh. The Curcuma longa plant is a member of the ginger family, an essentially looks like orange colored ginger root. As a spice, it provides curry with its distinctive yellow color and flavor. The flavor enhancing turmeric root powder is widely used in curry mixes, chutney, and mustard preparations. Consuming Turmeric with meals increases its absorption, especially with foods with a high fat content. It provides a nice earthy, peppery flavor with a hint of ginger. It gives seafood and poultry a warm color and compliments their natural flavors. It also goes well with rice, lentil, and vegetable dishes and can enhance the flavor of soups and stews. Since the flavor becomes more pronounced during cooking, you should add this spice slowly and taste frequently, so you don’t over spice your recipe. The highly studied active ingredient of turmeric is curcumin. A typical turmeric root contains about 2-5% curcumin. 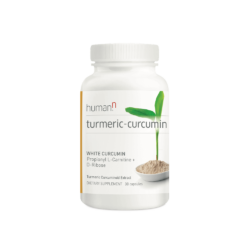 It is a member of the curcuminoid family and has been used for centuries in traditional practices Studies show that curcumin is a potent antioxidant, and it also supports a healthy inflammatory response throughout the body, as indicated in over 6,000 citations. In addition, over one hundred clinical studies have been carried out with curcumin, including research supporting positive effects on endothelial function. So the logical question is, “Can we get all the curcumin we need by adding the spice turmeric to our foods?” The limitations on consuming turmeric alone are two fold. First, turmeric contains only a small amount of curcumin, and second, it is poorly absorbed in the body. Clinical studies report as little as 1% of curcumin is absorbed after being consumed. This means you would need to add an extremely large amount of turmeric to foods to get the amounts shown in studies to provide benefits. Other common complaints about turmeric are related to the strong yellow pigmentation that can stain kitchen counters, utensils, and there have been reports of curcumin/turmeric supplements causing yellow sweat. Since yellow curcumin is excreted through the skin it may also stain your bed sheets and clothes. While turmeric is excellent when used as a spice, a curcumin extract nutritional supplement may be a better choice for health benefits. You may see some curcumin supplements with added piperine. Research has shown that an extract of black pepper, called piperine, significantly enhances absorption of curcumin. In fact, one study found that the addition of a piperine increased bioavailability 20 fold. This would be the equivalent of 2-4 whole packets of pepper and 2000 mg of curcumin if you were to try this at home. Addressing the problem of bioavailability, many different forms of curcumin have been researched. What was discovered is that it is not the curcumin, but its metabolite, tetrahydrocurcumin (THC), that is responsible for its biological function in the body. By using the bioactive form of curcumin, you can save the pepper for your foods, because it is easily absorbed in the body. Our Turmeric – Curcumin is formulated with C3 Reduct®, a patented form of tetrahydrocurcumin (THC), the most active type of curcumin in the body. This formulation solves many of the issues of standard curcumin products. Increased dosage efficiency- so less is more! As with any change in diet or supplementation protocol, it is always advisable to discuss with your healthcare practitioner, especially if you are on medications, are pregnant or breast-feeding or have medical issues. Effect of NCB-02, atorvastatin and placebo on endothelial function, oxidative stress and inflammatory markers in patients with type 2 diabetes mellitus: a randomized, parallel-group, placebo-controlled, 8-week study. Packed with antioxidants, our formula helps support healthy inflammation response as well as promoting cellular energy production.